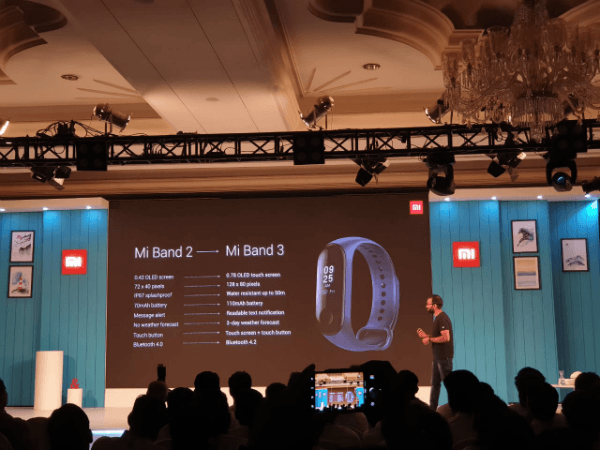 Xiaomi has finally brought its Mi Band 3 to the Indian market. The Mi Band 3, priced at Rs 1,999 comes with major upgrades over the Mi Band 2 that was launched nearly two years ago. The Mi Band 3 can be purchased in India starting tomorrow at 12 PM on Mi.com and Amazon India. Xiaomi also confirmed that the Mi Band 3 could be purchased via Mi Preferred Partner stores and Mi Home stores very soon. Alongside the Mi Band 3, the Chinese Internet company also took wraps off the Mi Purifier 2S, new Mi TV and so on. Here’s everything new on the Mi Band 3. The Xiaomi Mi Band 3 features identical design to the Mi Band 2, but the company has added a 2.5D curved glass on top of the 0.78-inch OLED display to make the band look more appealing. The display itself has a resolution of 128 x 80 pixels and it’s still a Black and White one. Also, it’s slightly bigger than the display we saw on the Mi Band 2. The display now shows 3-day weather information something which was missing on the Mi Band 2. Also, the OLED screen is a touch-sensitive one. One of the highlights of the Mi Band series is the stupendous battery life. The Mi Band 3 has a 110mAh battery and Xiaomi promises a battery life of 20 days with tracking features turned off. Talking about the tracking feature, the Mi Band 3 has a heart rate sensor like the Mi Band 2. And this around, the heart rate tracker monitors your heart data continuously. Other tracking features include sleep monitoring, step count tracker, cycling, swimming, walking and so on. The Mi Band 3 can be taken under water up to 50 metres for a swim without any hassle. 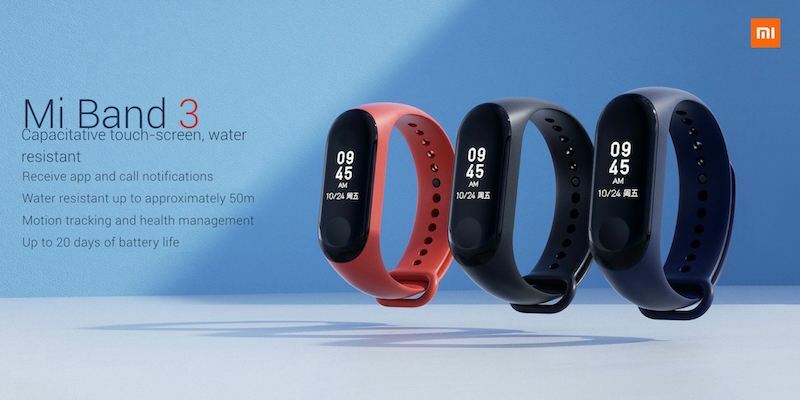 Sticking to its Honest Pricing tagline, Xiaomi has launched the Mi Band 3 at Rs 1,999, which was the same launch price of the Mi Band 2. The Mi Band 3 is an Amazon Exclusive product and can be picked up from September 28 at 12 PM. Notably, users can also purchase the Band 3 on Mi.com. As mentioned above, the Mi Band 3 comes with several major upgrades over the Mi Band 2. Right off the bat, the Mi Band 3 has a bigger display of 0.78-inch as opposed to the 0.42-inch OLED screen we saw on the Mi Band. While the Mi Band 2 is an IP67 splashproof product, the Mi Band 3 has proper water resistance and users can take up to 50 metres. The Band 3 also has a 110mAh battery as compared to the smaller 70mAh battery we saw on the Mi Band 2. The Band 3 works on Bluetooth 4.2 and also offers 3-day weather forecast. Thanks to the bigger screen on the Mi Band 3, users can now read text notifications on the band itself, which was not possible on the Mi Band 2. Looks exciting, bought one on today’s sale in Amazon. Excited about new Mi Tv. We need the 65 inch model.